As a beginner blogger, you need to know many facts about blogging, because when I have started blogging in that time, I did many mistakes, that's why I did not succeed in blogging earlier, I mean in the year of blogging 1 to 2 years. I do not want anyone will repeat those mistakes, like I did! That's why you can succeed in blogging easily, although it is not easy but it is not difficult even, the reason is in front of you, there are many professional bloggers, few bloggers are even making over 40,000$ per month. I have been blogging from last five years, I know what you need to succeed in blogging, that's why in this article I am going to share with you those mistakes I did, when I have started blogging. Although, In Blogging I did many mistakes, but I have learned from each and every mistakes, but I know every body don't have patience as much I do have, that's why I am sharing with my top mistakes, in the starting time of blogging. SEO stands for Search Engine Optimization, when I have started blogging in that time I did not know even such type of term exist in the internet, forget about concept, but after implementing more than 40 SEO Tips I come to know about the power of SEO in blogging. Let me tell you very frankly, jobs are getting lesser and lesser every day, even jobs portal websites increasing tremendously, that's why they can make money too. That's why every body starting blogging, from engineers to a 10th class student even, so the competition is too much, if you want to beat the competition you have to be unique and if you want to be unique you have to do lot of hard work, without hard work becoming successful blogger just about impossible. I will suggest you learn all basic concept of SEO before writing even your first blog post. Title of the blog post should be exact match as people are searching in the internet. Heading, subheadings, bullets, bold must use all these in the blog post. Believe me dear just follow these simple steps you will rock in ranking. As a beginner blogger, blogger is a good platform to get start blogging, because hosting is free even they give you a free blogspot sub domain name, but if you will not buy a domain name then probably you are not going to get from blogging, what you wanted to get? Now think about this, if you don't have domain name then how would be possible you will take your blog to the next level. See, you have to get domain name for your blog, if you really want to make money from blogging, then why not today. Buy a domain name from Bigrock Now. Note- Before going to buy a domain name make sure you have knowledge about setting up your domain name with your blog, otherwise just contact me I will do all these things for you. No matter in which niche you are blogging, competition is definitely there and also opportunity would be there, then what is the solution, i.e. writing better content, which exactly I did mistake, I usually write article of having 200 words, but later I come to know the power of writing long and descriptive blog post. Now I do not write even a single article, which is less than 800 words, you should do the same and one more issue I would like to share with you, never forget to add an image to your blog, which give better look to your blog post. I know Google is the best source to get traffic to your blog, but what about other sources like Social Media (Facebook, Google Plus, Twitter, StumpleUpon) and also email marketing. I will suggest you to use all these resources to increase your blog post reach to the audience, which will help you to build royal readers, which is really important to make money blogging. Email marketing, there are many email marketing service providers out there, but I like Aweber as well as feedburner to get start email marketing. Madmimi also a good choice, but I will suggest you to get start with Feedburner as a beginner blogger, it's free and also effective and of course this service is provided by Google. Note- If you want to start with pro one Get Response is there which I am using these days, its just awesome. I think as a beginner blogger to drive traffic to blog as well as to increase knowledge of yourself, comment of other blogs, but on your niche, which will also increase ranking of your blog on search engine page ranking, even it will increase back links of your blog, which is pretty good but don't be excited about commenting on other blogs, just do comments after reading the article, which will meet the actually purpose of commenting on other blogs. Hopefully, you will not repeat these mistakes, to be a smart blogger from day one, just build knowledge and implement then what next? Success! is waiting for you dear. 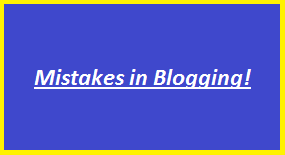 What Other Mistakes Beginner Bloggers Do? for my first blog, I committed similar sort of mistakes. I never commented on other blogs and never tried to make backlinks. That is why I suffered. Promotion of the blog among various social media networking sites also helps a lot. Good Point @Yogesh thanks for reading and best of luck! Yes, my dear beginners need to know all these tips and tricks to get success easily.